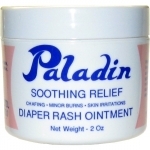 Paladin diaper rash cream is a blend of select ingredients to help treat and prevent diaper rash. Their gentle preparation is formulated to moisturize and soothe baby's delicate skin keeping it soft. 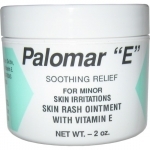 Palomar "E" skin rash Cream provides prompt, soothing relief against skin irritants, and acts as a protective barrier against irritation. Palomar E's soothing relief is beneficial for older people with primary onset of bed sores caused by sheet irritation, urinary burns, and poor bladder/bowel control.